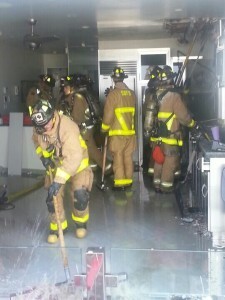 An electrical problem in a ground-floor kitchen wall sparked a fire today that caused an estimated $250,000 worth of damage to a Mission Beach condominium building. Crews knocked down the kitchen wall fire at a Mission Beach in about 30 minutes. Photo credit: San Diego Fire-Rescue Department via Twitter. The non-injury blaze in the 2900 block of Ocean Front Walk erupted about 10 a.m., according to the San Diego Fire-Rescue Department. The two people in the four-story structure at the time were able to escape on their own, SDFRD spokesman Lee Swanson said. It took crews about a half-hour to get the fire under control. “They contained it to that first unit and essentially to that wall, but there’s … a fair amount of damage there,” Swanson said. Investigators set the monetary losses at $150,000 to the structure and $100,000 to contents. The residents of the damaged unit told firefighters they could arrange for alternate lodging themselves, without help from the American Red Cross.